As we know development in F1 is relentless and so Mercedes continue to tune the W05 based on general R&D and circuit characteristics. For Suzuka the team have made a minor change to the base of their 'r' cascade, incorporating a slot into the base (circled). Reducing the length of the cascades base is clearly not possible, with it used to help in the turning of the airflow outward. 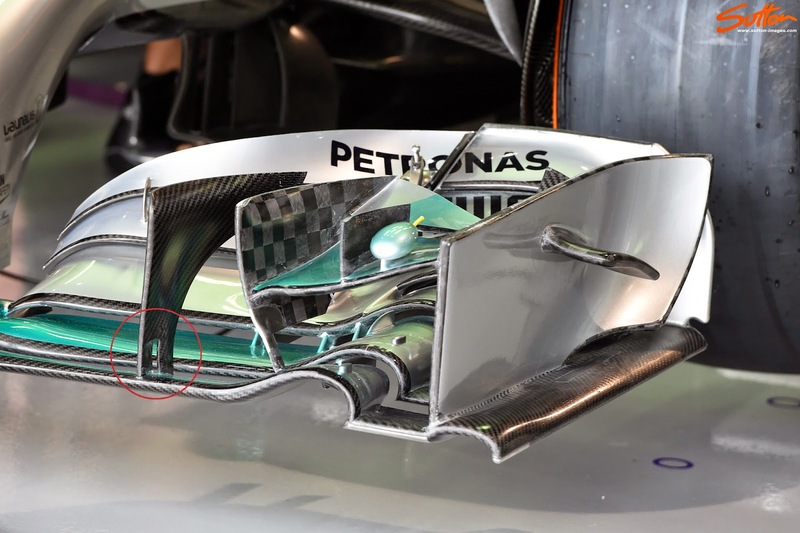 Reducing its length may cause too much flex, either compromising its aero characteristics or causing it to fail, both of which could be detrimental to performance. Adding a slot retains rigidity but removes an element of obstruction it causes to the elements cited behind it. As we can see the team have already made maximum effort to shorten the main cascades connection with the mainplane it sits astride.